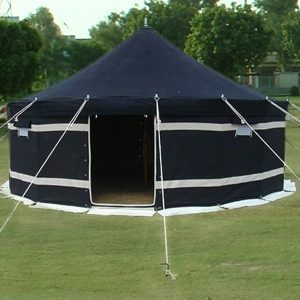 Outer Roof: Made of single layer of poly/cotton water and rot proof canvas of 450g/m2 Inner Roof: Made of two layers I.E. 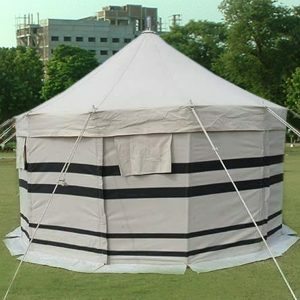 outer poly/cotton water and rot proof canvas of 450g/m2 and inner dyed cotton sheeting cloth. Packing: One complete tent packed in one hessian cloth bag. Made of two layers of dyed or natural color water & rot proof cotton canvas quality 600 g/m2 and inner side dyed or natural cotton dusooti cloth. Packing: One complete Tent Packed In one bag. 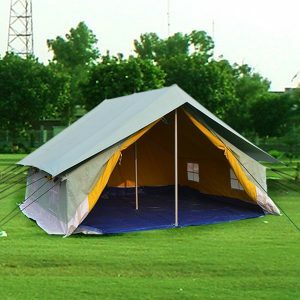 Made of two layers of dyed or natural color water & rot proof cotton canvas quality 600 g/m2 and inner side dyed or natural cotton dusooti cloth. Packing : One complete Tent Packed In one bag.